By rearranging donated flowers, we will deliver smiles, happiness and love to people in need. 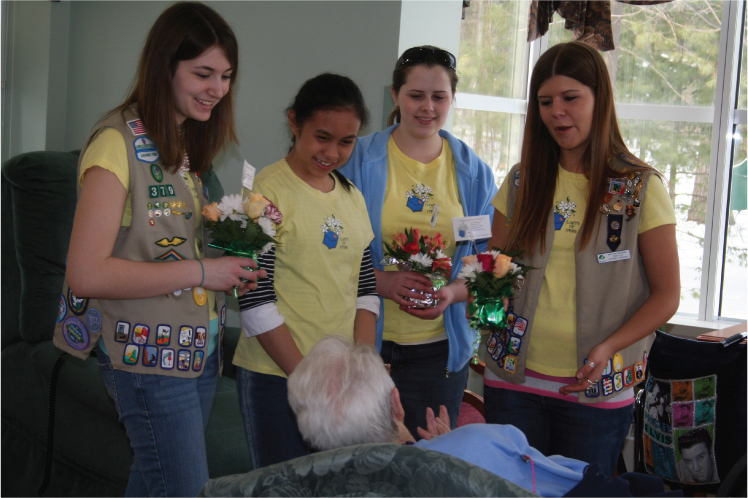 “Flowers For Friends” is a non-profit business planned and launched by the twelve members of Girl Scout Troop 379. The project focuses on refreshing donated flowers from weddings, funerals, church services and other events that would otherwise be thrown away and reassembling them into smaller arrangements to be delivered to community members who are isolated and in need of a smile. Each arrangement is hand delivered by a member of our team with a project business card personalized to acknowledge the flower donor. During deliveries, team members make every effort to communicate and build relationships with the recipients our flowers will affect. By reusing and recycling, we will also reduce waste output and have an environmentally friendly effect on our community. Flowers chase away anxieties, worries and the blues. Living with flowers provides a boost of energy, happiness and enthusiasm at work. The primary driving force behind “Flowers For Friends” is human energy, not money. However, the project does require some funding to operate. Donations provide the project with paper to print thank you notes; cardstock to make the personalized cards that go on arrangements; ink cartridges; gas to make the delivery of flowers possible; cellophane, oasis, ribbon, and plastic bags to create the arrangements; and brochures that explain the mission of the project and help us to get flower donations. Youth Venture Grant: The “Flowers For Friends” project has been awarded a Youth Venture Grant from Youth Service America. After a presentation by conference call to a Youth Venture Grant panel in Washington DC, the troop was given a seed grant for this project. Youth Venture Grants recognize young leaders that are developing sustainable community service ventures. Community Donations: “Flowers For Friends” has received many donations of flowers and funding from individual donors, churches, businesses and service groups. A significant donation in support of the project was received from the Ward & Eis Elder Projects Fund, The Petoskey Harbor Springs Community Foundation, which was established to enrich the lives of elders. Interacting with elders during flower deliveries is one of the most rewarding parts of the project. These visits provide a richness beyond what could be imagined from a simple flower delivery. 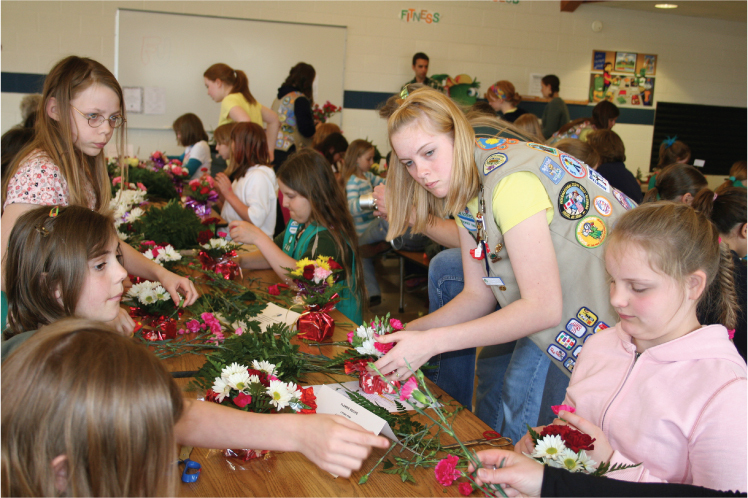 On Global Youth Service Day (April 27, 2008), the project provided an opportunity, at no cost, to area-wide Girl Scouts, to learn to make two Flowers For Friends arrangements. On a single day, this event produce 500 arrangements which were distributed, along with personal visits, throughout our community to recipients in need of a smile. Flowers and supplies for the "Fun With Flowers" event were supplied by Denver Wholesale Florist of Flint and Cleveland Plant and Flower of Traverse City. The "Fun With Flowers" event was also supported by a Wal-Mart Foundation Community Grant. We invite you to stop by our office located in the back of Flowers From Sky’s The Limit in downtown Petoskey, Michigan at 413 Michigan St. anytime during our business hours, Tuesday through Thursday weekly, from 3:30 to 5:30pm to see the project in action.